Vincent and Irene Brennan have three children – Conor, Caoimhe and, their youngest, Donal. Donal seemed to be developing perfectly for the first year or so of his life. Just like Conor and Caoimhe had. Then, when Donal was around one and a half years old, all the words he had learned simply disappeared. He became insular and very patterned in the way he behaved. ‘He would run down the hallway in the house looking at the railings on the radiator as he went by and he would line up all his toys. It all seemed quite strange,’ Vincent says. Vincent and Irene knew that something had happened to Donal but didn’t know what. The state assessment programme was very slow and it was taking a while to get a diagnosis but then a chance meeting led to a helpful tip. Donal and Vincent flew to London where Donal was diagnosed at 5.5 on a scale of 1 to 10 on the autism spectrum. ‘It was a bad day and a good day,’ Vincent says, of the day Donal finally got a diagnosis. Bad because there’s no ‘cure’ for autism. Good because as soon as Vincent and Irene knew exactly what was wrong they could get start to get Donal what he needed. Life became centred around Donal. Donal’s mother, Irene, (‘she is incredibly resourceful,’ says Vincent) pursued the different interventions he needed starting with early language intervention. She managed to get him into the Red Door School which describes itself as a school ‘for children with autism and complex needs’. The school used Applied Behaviour & Analysis (ABA) techniques which involve identifying individual behaviours that might be changed then breaking them down into small, bite-size chunks and rewarding children for carrying out each new step in the process. Vincent compares it to the way parents teach a child to tie a shoelace. The learning process might take ‘five, ten, fifteen times longer than somebody else’ but once people with autism learn it they have it. When Vincent and Irene decided they wanted Conor and Caoimhe to understand that Donal would always have autism they decided to best way would be for them to watch the movie ‘Rain Man’. But what was the right age for them to see it? And how would they react? They thought carefully about it and eventually showed it to them when Conor was 12 and Caoimhe 10. Then, while they were still watching the movie, Donal came in. He listened as Dustin Hoffman or ‘Rain Man’ repeated the same phrase over and over. ‘And Donal asked, ‘why does he keep repeating the same thing he’s saying?’ Vincent says. Vincent remembers Donal’s psychologist at the time saying that Donal becoming self-aware of having autism was a huge achievement. ‘It was moving and profound, in its way,’ Vincent says. Donal’s way of coping is to be in control. Vincent is keen to point out that Donal can change, but any change has to be discussed in advance, described in detail, and trialled before it can be attempted. He gives me an example. Vincent and Irene wondered if Donal might get into GAA if he went to watch a match but because he’d never been before they needed to prepare him. ‘We rehearsed going to Croke Park for weeks before actually going,’ Vincent explains. ‘We explained the rules simply to him. We gave him a little scoring sheet so that he could understand the scoring system’. 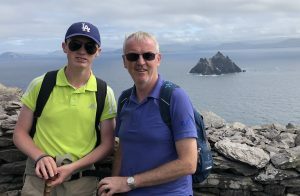 The couple showed him photos – Donal learns best from visuals – to give him a sense of where he was going and to reduce his uncertainty about the new experience. 10 minutes into the game, things were looking pretty bad for Mayo as Dublin were already up 2-4 to no score. Donal and Vincent regularly go to games now. Unsurprisingly, Donal mostly wants to go to games when Dublin are playing. Where Donal has behaviour challenges, they typically fall into one of two categories which Donal has named ‘gevoid’ – a combination of the words ‘get’ and ‘avoid’. He loves fusing words like this. ‘Gevoid’ has become a useful trigger word for the family. Vincent says that he can get frustrated with Donal’s behaviours at times and, as a result, react in the wrong way but ‘gevoid’ can help him as well as Donal. Donal’s knowledge is literally encyclopaedic, says Vincent. ‘His computer crashed one day and we went to Curry’s or one of those places to get it fixed. The guys were able to retrieve the hard disk, save the data and reload it onto something else. It was only then that Vincent realised that, in addition to being stored on the computer, everything was in tables in Donal’s head. ‘It was a fascinating insight,’ he says. Every disability has its challenges and autism is no different. The first, and one that is sometimes overlooked, is that there are no visible signs that most people with autism actually have a disability at all. ‘If you bump into Donal for that first few seconds he’ll present as able and normal as anybody else. And then, at times, when he behaves differently, that’s quite a challenge for people because, I suppose, they just don’t see it coming,’ says Vincent. Autism is often referred to as the ‘invisible disability’ because of this lack of obvious outward signs. The second challenge is Donal’s limited social interaction skills. The third challenge is his rigidity. Donal is 19 now and in a ‘school to work’ programme as part of the National Learning Network. ‘Donal’s a fantastic young man,’ says Vincent who is proud that Donal has Junior Certs in Maths, English and in Civic, Social and Political Education. 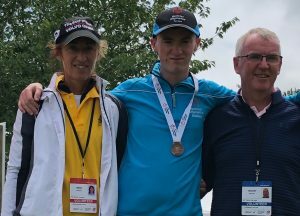 He skis, swims, runs, plays golf and plays tag rugby winning gold medals at the Irish Special Olympics in three of those disciplines in the last couple of years. Donal has also completed two work placements at Bank of Ireland doing data entry work. ‘The colleagues he worked with said he was ‘very diligent, very capable, self-correcting, and punctual’, Vincent says. The difference between Donal at one and a half years old, when he was completely non-verbal, had no obvious communication skills and was very rigid in his behaviour, and today is incredible, Vincent says. But he and Irene, like other parents of children with autism, are very clear about the language they use to describe Donal. Donal isn’t autistic, he has autism. There’s a difference. Vincent says that his experience of managing Donal’s autism helps inspire him as the executive sponsor of Bank of Ireland’s Accessibility Network. 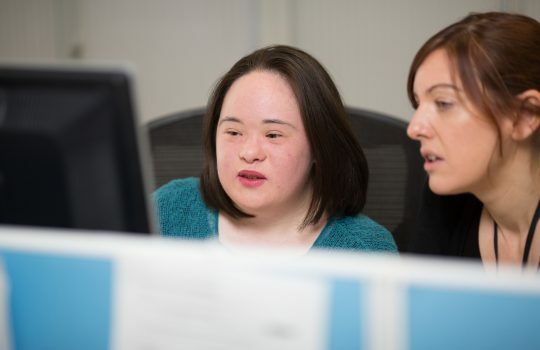 The Accessibility Network focuses on enabling customers, colleagues and communities to thrive from the perspective of accessibility and disability inclusion. ‘One of the reasons I was delighted to sponsor the Accessibility Network was that I had seen that there’s this amazing ability in everybody if you can just find the way to unlock it and that’s what we’ve been trying to do. Their contribution to an organisation can be massive. In addition, he says that he wants to help encourage ‘an affinity towards the accessibility agenda among colleagues so that people can bring their whole selves to work. I’m really encouraged by the work we are doing and the enthusiasm for everybody involved. 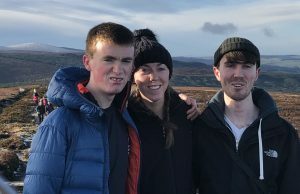 A recent assessment reminded Vincent that although Donal has progressed hugely the fundamental challenges that autism poses for him are still the same. Experts are still unsure what causes autism and there is still no cure. However, what they can agree is that, because autism is a spectrum, everyone who has autism is different. As Vincent is keen to emphasise, the challenges that people face do not define them. Everyone, whether they have autism or not, has the potential to thrive if we can just accommodate their needs and assist them to contribute their unique gift to the world. To find out more about inclusion and diversity at Bank of Ireland click here. For more information or for help with autism, please visit the Irish Society for Autism website. By clicking on the link to the Irish Society for Austism you are leaving the Bank of Ireland website. Read more of What happened when a woman with Down syndrome gave a speech to prisoners? What happened when a woman with Down syndrome gave a speech to prisoners?